Now that you are officially in the league of awesome, let me start you off with a couple of free books! Simply click below for whatever format you like. Enjoy! 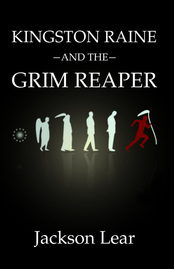 The Grim Reaper finds himself confronted with his most challenging death ever: that of Kingston Raine, an industrial thief and all-round smartarse. Before long, the Grim Reaper comes to realise that Kingston may be the only one capable of thwarting a coup that threatens the entire afterlife. Unfortunately, Kingston just did the impossible and found a way to escape back to his own universe.